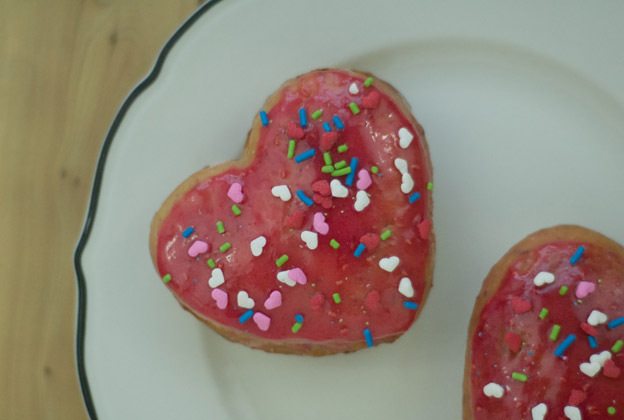 Nothing says "I love you" like fried dough covered in sugar (and topped with raspberry glaze if you really mean it). I'll go ahead and state the now obvious. I'm a sucker for Valentine's day. 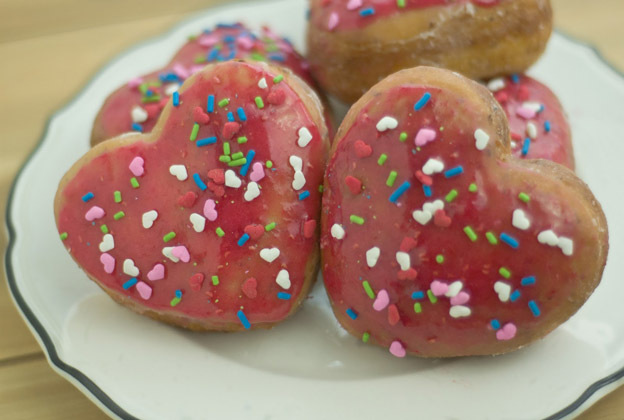 And since you clicked on a picture of heart-shaped doughnuts to get here, I'm gonna guess that you are too. So Hooray! Lets dork out together. Doughnuts are easy & stress free. They're always fun to make on your lounge around the house day. They require two long breaks to let the dough rest & rise which gives you time to clean, read, nap, watch tv, sip some wine & just relax. Or you can go another route & spend that time trying to figure out how to play Epic Mickey 2 on the wii... That game puts me in such a grumpy mood! How the hell do you play!! I paid $40 for that dumb game...I'm gonna figure it out if it kills me. Mickey, I sure did love you growing up but right now I just wanna punch you in the face. I'm getting heated all over again. These little guys would make a cute gift for your ladies on Galentine's day. Maybe for your co-workers or classmates. Just package them in individual clear bags with a cute little ribbon. They can also be a yummy gift to your man or lady. If they are anything like my man, they will happily accept them with open mouths. Annnnnd...if you're anything like me, you'll be upset with yourself for giving your significant other access to a dozen doughnuts because there is a good chance he or she will eat them all in one day. True story. Dissolve yeast in warm water and let sit for 10 minutes. In a small saucepan, heat milk over medium-low heat. Mix in shortening and vanilla. Mix until shortening has melted and remove from heat. In a small bowl, combine flaxseed & water. Set aside. In the bowl of an electric mixer, mix the sugar & salt. Add the "milk" mixture and mix on low speed just to dissolve the sugar. Beat in the yeast mixture, flaxseed mix, and 1 cup of flour on low speed until smooth. Gradually beat in the remaining flour. Continue beating until the dough leaves the sides of the bowl. Turn the dough out onto a well floured surface and knead for about 2 minutes or until smooth. 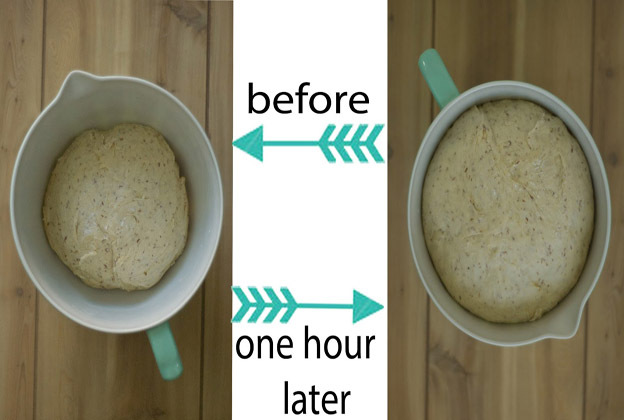 Form the dough into a ball and place into a large greased bowl. Grease the top of the dough and cover the bowl. Let the dough sit and rise until double, at least 1 hour. Punch dough down and roll out on a well floured surface to 1/2 thick. 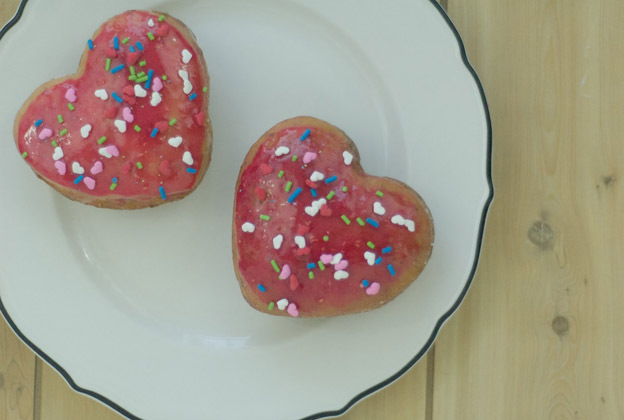 Cut out heart-shaped doughnuts with cookie cutter. Let them sit and rest again for another 40 minutes. Heat oil in a deep fryer to 350-375. Gently pick up and drop the doughnuts in the oil 2 at a time. Cook until they are light golden brown, about 1 minute on each side. Chopsticks making turning the doughnuts super easy. Drain the doughnuts on paper towels. First glaze: Melt butter and mix in sugar, vanilla, and add water to get the consistency you desire. Dip fresh doughnuts into the glaze and let them sit on a wire rack to drain. While the first glaze dries, combine raspberry puree & sugar. You can also add a little water at a time to thin out the glaze if it's too thick for your liking. Dip one side of the doughnuts into the raspberry glaze. Don't forget the sprinkles! These would also be good with some whipped coconut creme in the middle! 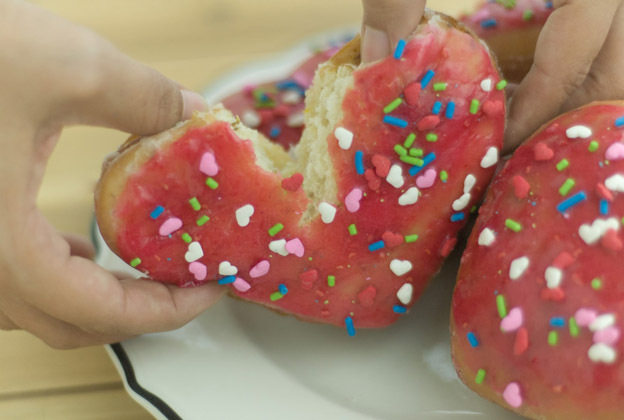 Note: I made a dozen GIANT fluffy doughnuts with this recipe. You can easily get more than a dozen out of it if you like.